The exercise management team coordinating a debriefing session in the Emergency Operations Centre at WHO/Europe. 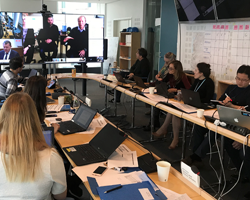 In alignment with the new Action Plan to Improve Public Health Preparedness and Response in the WHO European Region, the WHO Regional Office for Europe is supporting its Member States in scaling up their health emergency preparedness and response capacities through a series of capacity building initiatives. Outbreaks and health emergencies continue to reveal that they can happen in any country, at any time. This requires all countries to prioritize and prepare for different types of health threats, be they infectious diseases, natural disasters, conflicts or environmental risks. A critical part of this preparation is capacity building through trainings and simulation exercises that are essential for enhancing International Health Regulations (IHR) core capacities throughout the Region. In October, the Regional Office conducted an IHR National Focal Point (NFP) workshop with participants from ten countries. The workshop provided an opportunity to share experiences and best practices on various aspects of national preparedness and response capabilities, procedures and communication and coordination mechanisms. Simulation exercises were one of the topics that NFPs identified as a priority area for the Regional Office’s work with Member States. “It is clear that the International Health Regulations (2005) are more relevant than ever, and it is encouraging to see that countries are prioritizing and building their national capacities to prevent, detect and respond to all types of health threats,” said Dr Dorit Nitzan, Coordinator for Health Emergencies, WHO Regional Office for Europe. In November, 27 WHO Member States participated in the first annual Joint Assessment and Detection of Events (JADE) functional simulation exercise. JADE tested communication and coordination between IHR NFPs in countries and IHR duty officers at the Regional Office. While the exercise focused on NFPs, many countries included other team members from within their respective health departments. The ability to work across disciplines and sectors will be essential for timely notification and communication, rapid needs and risk assessment, and the initiation of technical and operational support. “These trainings and simulation exercises and others have proved to be an excellent way to test and evaluate emergency response plans and mechanisms before lives are on the line, allowing for countries to prioritize and invest according to their most urgent needs and gaps,” added Dr Nitzan. This needs-based approach to capacity building is an important component of the new Action Plan to Improve Public Health Preparedness and Response in the WHO European Region. The Action Plan was welcomed by all Member States of the WHO European Region in September 2018 and is a call for all countries to strengthen or maintain emergency response capacities through, for example, training and opportunities to practice and review new and existing capacities. Despite considerable progress in these areas, however, much more work needs to be done. Sustained political and financial commitment is critically important to address current deficits and challenges. Together with donors and implementing partners, WHO remains fully committed to supporting Member States and expanding the use of simulation exercises and other emergency preparedness and response capacity building initiatives in line with the Action Plan and within the framework and principles of the IHR (2005).